Autumn Road Santa Fe. By Norma Basset Hall. 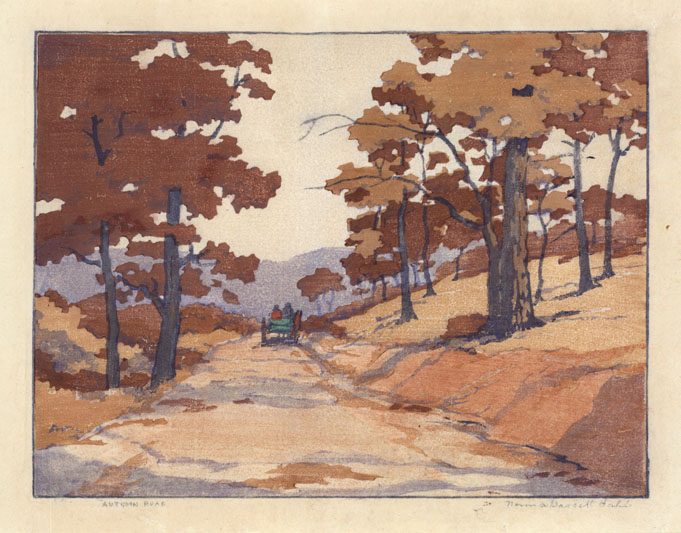 Color woodblock, 1928. Signed in pencil by the artist. The Old Print Gallery is proud to announce its new fall print show, Ink & Grain, which will open on Friday, September 19, 2014 with a free opening night reception from 5-8pm at the gallery. Ink & Grain is a group show, highlighting 20th century printmakers who excelled in woodcuts and wood engravings. The exhibit will remain on view at the Old Print Gallery until November 15th, 2014. One of the most ancient forms of printmaking, the woodcut was in huge decline in the 19th century, as printmakers turned to other forms of reproductive mediums. Luckily, the 20th century saw a revived and energized artistic expression for woodcuts and wood engravings. These new woodcut artists experimented heavily with technique, in ways both innovative and nuanced. Printmakers, like Werner Drewes and Barbara Latham, incorporated the grain of the woodblock directly into the composition of their prints- surrendering to its complexities while highlighting its unique, undulating patterns. Others, including Gustave Baumann, Leo Frank, Norma Bassset Hall, and Luigi Rist, experimented with new methods of ink and color application, resulting in stylized prints in a bold, modern palate, as well as softer, luminous color prints inked onto thin Japanese paper. Sea Shell and Garlic. Luigi Rist. 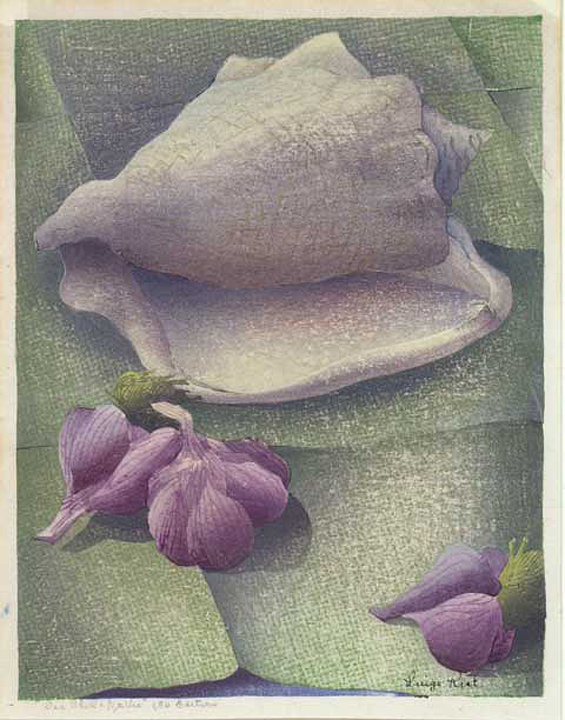 Color woodcut, 1947. Signed in ink on the block. Titled and inscribed “150 Edition” in pencil. Wood engravings also saw a resurgence during the 20th century, especially in the form of artist’s hand-made books and commercial book illustrations. 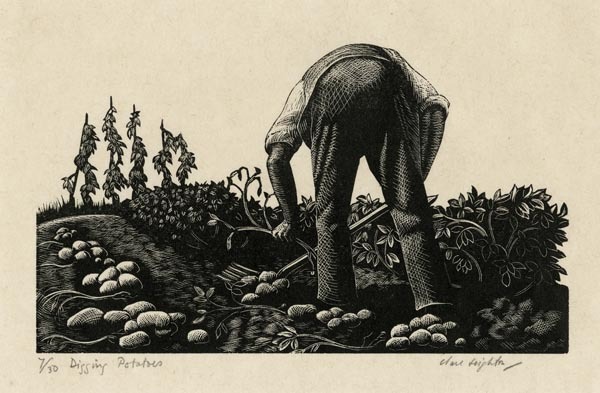 The show includes works by skilled wood engravers Clare Leighton, Lawrence N. Wilbur, and John Murphy, all who made a name for themselves as dynamic illustrators and artists. Digging Potatoes. By Clare Leighton. Wood engraving, 1935. Signed and titled in pencil. Edition 30. Selected Artists: Gustave Baumann, Asa Cheffetz, Werner Drewes, Leo Frank, Antonio Frasconi, Eliza Draper Gardiner, Norma Bassett Hall, Barbara Latham, Clare Leighton, Alessandro Mastro-Valerio, John J. A. Murphy, Luigi Rist, Mabel Royds, Charles Svendsen, Paul Wenck, Lawrence N. Wilbur, and Adja Yunkers.